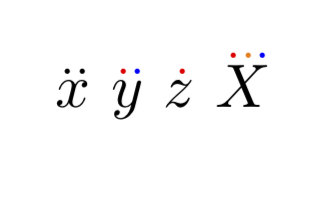 How can we change any of the two dots of the ddots math symbol? 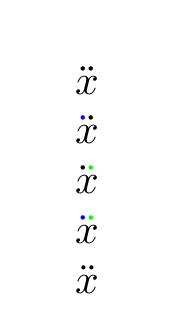 The following uses two slightly shifted coloured \dot macros. The placement is not perfect and might be really bad for some letters. % optional argument will be split at a "," once. Adapting from the definition of \dddot in amsmath. The bottom line in the picture shows the symbol superimposed on each other; the difference is really negligible. 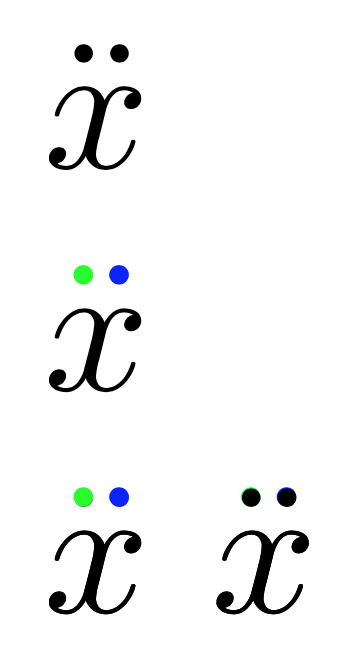 Beware that the different colors will make the dots to appear misaligned. One may just use the accents package, which was made for this. Not the answer you're looking for? Browse other questions tagged math-mode formatting color or ask your own question. How to change the label color of \psaxes? How to change the color of Table of Contents from red to black? How to change the color of bibitems?